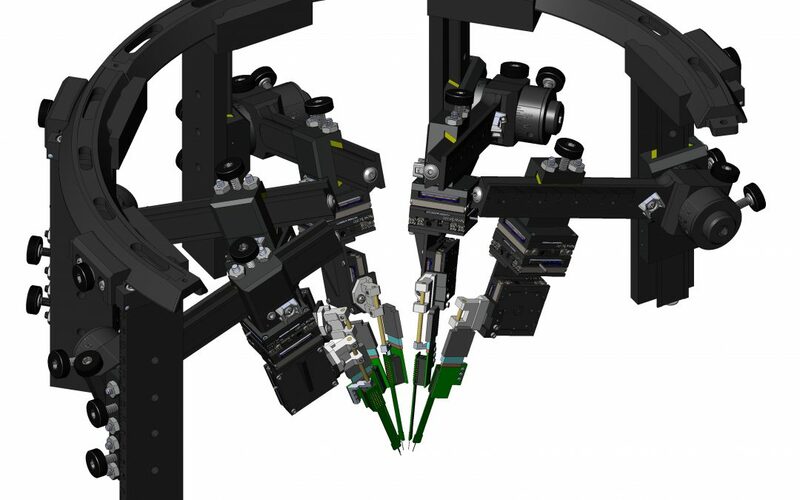 Victor, NY – Nov. 2, 2017 – New Scale Technologies’ Multi-Probe Micromanipulator (MPM) system will be featured by several of the company’s partners at Neuroscience 2017, November 11-15 in Washington, DC. NeuroNexus, the company’s newest MPM System distributor led by internationally recognized expert in neurotechnology and biomedical engineering Dr. Daryl R. Kipke, has added the precision multi-probe micro-manipulator to its line of high-value neural interface technology, components, systems, and software. NeuroNexus will demonstrate the MPM System in Booth #2234, using it to position three NeuroNexus A32 silicon neural probes. Product demonstrations in the NeuroNexus booth are planned for Sunday, Nov. 12 at 4 pm and Monday, Nov. 13 at 10 am. Cambridge NeuroTech, a biotechnology firm led by experienced neuroscientist Dr. Tahl Holtzman, will answer questions about the MPM System and explain how it facilitates recording with Cambridge NeuroTech’s Acute Probes. A team led by Dr. Josh Siegle, a primary contributor to the MPM System development, will present a poster session entitled “Measuring cellular-level interactions across multiple areas in mouse visual cortex using parallel silicon probe recordings.” The session includes a description of how the researchers used the MPM System to align up to six 384-channel Neuropixels probes to area maps. Poster Session 490.14 / CC31 takes place Tuesday, Nov. 14 from 9 am to 10 am.